The consistency on design and construction is an important factor on pavement performance. Layer thicknesses play an important role in the response of flexible pavements on service. Differences on layer thickness between as-designed and as-built are significant in the performance of a pavement structure. Colombian highway construction specification allows tolerances in pavement layer thicknesses which may shorten the pavement service life. A study was performed to investigate whether the allowed construction tolerances have significant effect on flexible pavement performance. Two flexible pavement structures were analyzed; one structure included a cement-treaded base layer. For each structure, all layer thicknesses were varied simultaneously within the construction tolerances by using statistical simulation techniques, a total of 100 variations were performed for each structure. The performance of the resulting modified structures was evaluated using the companion software of the Mechanistic-Empirical Pavement Design Guide (MEPDG). The parameters considered in this study were roughness, bottom-up cracking, and rutting. The results show that reductions on thickness in the asphalt layer and the cement-treaded base layer, within construction tolerances, have significant effect on pavement performance. Variations on layer thicknesses, within construction tolerance, of granular base and sub-base have no significant effect on pavement performance. The structure of a flexible pavement is composed of several layers: asphaltic, granular or stabilized layers. The design of such kind of structure consists in determining the characteristics and thicknesses of each layer, so that the resulting structure will be able to bear traffic loads under expectable weather conditions, thus providing appropriate pavement condition during the design period. Material and sub-grade properties, as well as traffic and weather conditions, are considered during design stage. Consistency between design and construction stages is a key factor for pavement behavior. Layer thicknesses play an important role on the behavior of in-service flexible pavements (Jiang et al., 2003). Difference on pavement layer thicknesses between as-designed and as-built are a decisive factor for the structure durability. For example, fissures highly depend on layers thicknesses (Xu et al., 2011). Layer thickness variations, due to constructive problems, affect the pavement structure durability. In this regards, there are several research works relating as-designed with as-built asphaltic pavement, which demonstrate a wide thickness variation margin on as-designed and as-built layers. Such variations show a normal distribution; the trend is that thicknesses of thin layers tend to be above the ones designed. Meanwhile, for thick layers construction is carried out under as-designed limits. (Mladenovic et al., 2007). Other problem is the variation of in-service asphaltic layers thicknesses due to compactation effect (Xu and Huang, 2011). Detailed knowledge on design-construction relationship and the effect of its deviations on pavement structure performance are required; so as to assess constructive processes, improve roads infrastructure quality and improve the reliability concepts on pavements design methodologies. The purpose of this research is to evaluate the effects of as-designed and as-built layers thicknesses on flexible pavements performance, assuming that proper execution of construction process and quality control are provided, in order to fulfill the highway construction specifications in Colombia (Invias, 2007). Such specifications allow tolerance margins between as- designed and as-built pavement layers thicknesses. The effect of such tolerances has not been assessed previously. This research analyzed two pavement structures; one of them included a cement-treaded base layer. By employing the statistical technique of Latin Hypercube Sampling (LHS) on each structure, the thicknesses of all layers were simultaneously modified within allowed tolerances. 100 variations were carried out for each structure and later the performance of each layer thickness combination was assessed by employing the Mechanistic-Empirical Pavement Design Guide (MEPDG). The studied parameters were roughness, bottom-up cracking and rutting. LHS is a random sampling technique, where the experimental area is divided into n strata, or sampling sections, of identical length and probability. For each stratum a representative random sample is created, which is repeated according to the number of intervals, so as to obtain a representative sample of the experimental area (Baron, 1999). Strata are uniformly allocated along the experimental area. A stratum reference point is selected at random, in order to build an n size sample (Santner et al., 2003). The use of LHS allows samples production of uniformly distributed recordings alongside each variable. 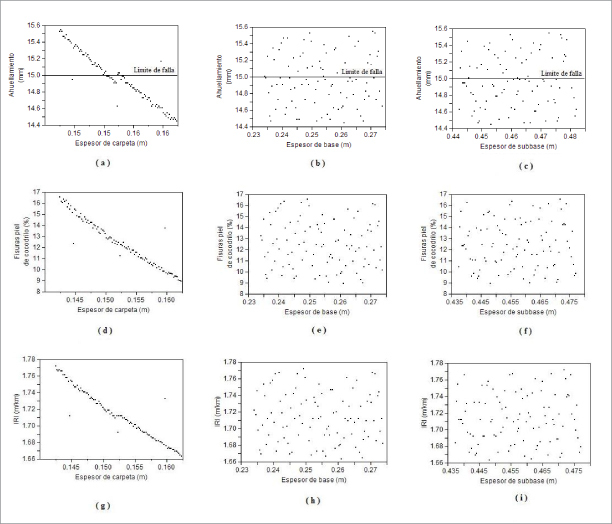 In order to carry out a LHS simulation, the model under study shall be run the number of iterations corresponding to the intervals previously created for the application of LHS. The use of LHS in simulation processes decrease execution times and complexities of employing a great amount of variables and data (Matala, 2008). MEPDG is the result of research carried out in the United States, oriented to develop a pavement design method based on mechanistic-empirical pavement design principles (ARA, 2004). Newly introduced, MEPDG and its companion design software constitute a significant improvement to the state of practice on pavement design. This design methodology involves response models and performance models used to simulate pavement behavior by predicting its performance over the design period the design period. Entry data are grouped into traffic loads, material properties and weather conditions. The use of MEPDG improves design issues, which were previously not considered or delivered less accurate results from previous design methodologies. For example, MEPDG controls material properties and weather effects in detail. The software is able to simulate the structure behavior for the whole design period and to identify when an early pavement failure is taking place. The simulation accuracy will depend on the quality of information employed and the calibration of the performance models to local conditions (Bustos et al., 2011). Four stages were developed to analyze the effects of layers thicknesses variability on pavement performance: 1) Definition of structures to be evaluated; 2) Identification of constructive tolerances for layers thicknesses; 3) Computer simulation; and 4) Result analysis. Two pavement structures were defined from the analysis on the most common materials in the local region, Figure 1. The Structure 1 is composed by the asphaltic layer, granular base and granular sub-base. This type of structure was selected because its use is quite common in this region. The Structure 2 has the same layout as the first structure, but includes a cement-treaded base layer (more rigid than Structure 1), which enabled the assessment of performance effect of thickness variations on cement-treaded base layers. The determination of material properties for MEPDG design employed a hierarchic level 3. The asphaltic layers module was assessed in both structures by means of the MEPDG predictive equation based on the characteristics of the asphaltic mix: Poisson ratio for the mix was 0.35. MEPDG estimates the variations of asphaltic mixes properties during design period, depending on weather conditions, which were considered using data of western south area in Colombia. In both structures the module (kg/cm2) for the base, sub-base and sub-grade were 2110, 1760 and 1055, respectively; Poisson ratio: 0.4, 0.4 and 0.45, respectively. For the cement-treaded base layer the module was 7000 kg/cm2 and Poisson ratio of 0.2. Each structure was designed in accordance to previously established service conditions. Design was developed employing MEPDG, in such a manner all design criteria were met and all layer thicknesses fitted, as much as possible, to traffic and weather requirements, by considering material properties. Traffic loads, weather conditions and material properties are fixed parameters and were not modified during the simulation process. The interaction of such factors could deliver different results under different conditions. However, the methodology introduced by this paper can be used under different combinations of weather, traffic and material properties. Tolerances are constructive differences allowed for layers thicknesses of a built pavement, in relation to the thickness required by design stage. Although, it would be expected that there were not differences between as-designed and as-built layer thicknesses, the practice shows differences due to excess or imperfection because of the lack of accuracy during constructive processes or poor quality control. 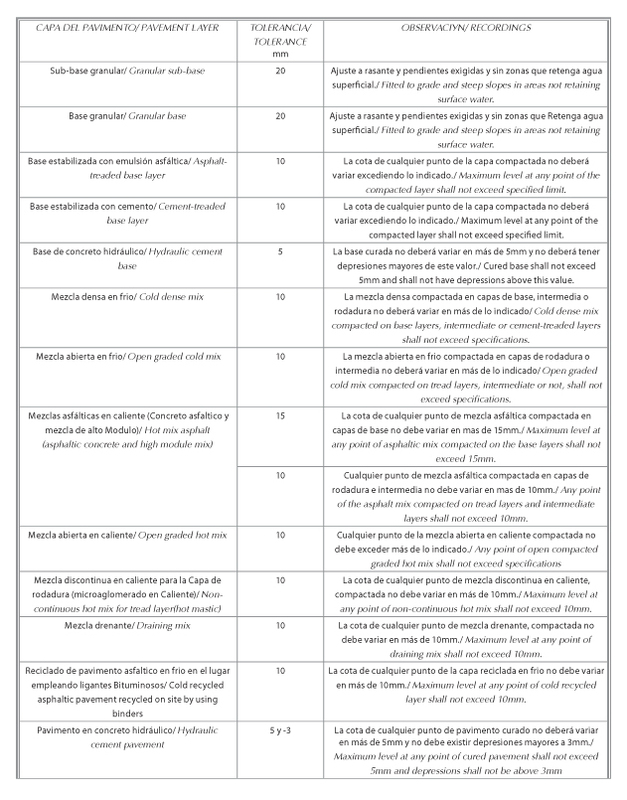 Construction tolerances on layers thicknesses allowed by Colombian specifications for highways construction are shown by Table 1 (Invias, 2007). Table 2 shows that depending on the type of layer material, the allowed tolerance varies as far as thickness is concerned. For unbound granular layers, tolerances up to 20 mm are allowed; for asphalt or cement treaded base layers up to 10 mm, for cold mix asphalt up to 10 mm, for recycled asphalt material with cold bituminous binders up to 10 mm and, for hot mix asphalt up to 15 mm. Although these individual tolerances seem to be small, the addition of tolerances taking place simultaneously in the whole structure results significant For example the most critical case for Structure 1, would represent a reduction of 15 mm for the asphalt layer, 20 mm for the base, and 20 mm for the sub-base. Therefore, the structure would have a total thickness reduction of 55 mm. For structures having more layers; the allowed thickness reduction would be higher. The current research employed computerized models for layers thicknesses sampling and for predicting pavement performances. In order to obtain layers thicknesses combinations, the random sampling technique LHS was employed. The analysis of pavement structures was carried out by using MEPDG. LHS allows to consider the random effect of thickness deviation on as-built layers compared to as-designed layers, by taking into consideration that variation in one layer is independent from the other layers variation. However, variations in any layer may take place in the structure simultaneously. In the first place, for each structure under analysis the probable variation ranges were defined for each pavement constructive layer, in accordance with tolerances shown on Table 1. Variation ranges are displayed on Table 2. By employing LHS, 100 iterations were defined for each structure under analysis. Each repetition corresponded to a structure which is similar to the initial one, but having thickness variations for every layer, which were restricted to allowed tolerances. This procedure guaranteed randomness of each thickness selection. Then, each repetition represented a situation, which is likely to occur in construction processes. Afterwards, for each repetition a performance prediction was developed by using MEPDG. In total 200 MEPDG repetitions were carried out: 100 for Structure 1 and; 100 repetitions for Structure 2. Parameters analyzed included roughness, bottom-up cracking and rutting. MEPDG measures roughness in terms of International Roughness Index, IRI (ARA, 2004). For this research purposes it was defined that the structure failure takes place under any of the following situations: IRI≥2.7 m/km, bottom-up cracking ≥25% or rutting ≥15 mm. Finally, an analysis was developed by using the information achieved from computer simulation, so as to evaluate the effect of thickness variations on each studied parameter and, the pavement early failure in accordance with the design period. An analysis was developed using the results obtained from simulations on each structure, which purpose was to identify the effect of layers thicknesses variations on failures preceding MEPDG. Figure 2 shows the IRI behavior as well as rutting and bottom-up cracking behaviors upon the layers thicknesses variations in Structure 1. There is a high correlation between the asphalt layer thickness variation and the pavement failures variations; as long as the layer thickness is decreased, IRI, rutting and cracking increase even using variations within allowed tolerances. Such correlation is not observed from granular layer bases and sub-bases. In the case of a pavement structure made up by asphalt layer, granular base and granular sub-base, as Structure 1; the pavement durability becomes compromised by the asphalt layer variations, even when such variations are within tolerance limits allowed by construction specifications. An adequate MEPDG design specifies that all parameters shall be under failure limit, by the end of design period. When comparing results obtained from simulation, by employing previously established design limits, it is observed that rutting is the parameter that controlled the design. In the case of rutting, Figure 2 shows the failure limit and we can observe there are values above the limit. 47% of structures (iterations) failed before concluding design period. Among failed structures, 89.3% of them show asphalt layer thicknesses lower than the original design. 53.2% of them have a base thickness lower than the original design and, 44.7% have a sub-base thickness lower than the original design. In other words, most failed structures have an asphaltic layer reduction in comparison to the original design. Almost half failed structures have lower granular sub-base and granular base thicknesses. Consequently, the remaining half will have higher layers thicknesses for base and sub-base. Above, together with the lack of correlation between thickness variations and failure variations, shows that thickness variations for granular base and granular sub-base (within the allowed tolerances), do not significantly affect pavement durability. Failure limits for IRI and cracking are not shown in Figure 2, because structures do not achieve design limits at all. The maximum IRI value achieved by iterations was 1.77 m/km. Similarly, cracking achieved a maximum value of 16.5%. The difference between Structures I and 2 is that the latter includes a cement-treaded layer, which allowed the analysis of pavement performance facing thickness variations, among allowed tolerances for this type of layers. The analysis of simulation results from Structure 2 confirms that granular base and granular sub-base thickness variations, within allowed tolerances, have a minor effect on pavement performance. Therefore, the analysis on such layers for Structure 2 is disregarded. Figure 3 shows the effect of allowed layers thicknesses variations, in relation to the failures under study. It is observed that failures take place for all studied damages. The amount of structures failing due to IRI is reduced in comparison to structures failing due to the other damages. The 49% of total structures failed due to rutting, but several structures failed at values quite close to failure limit, so a small thickness increase would place such structures below the failure limit. Other structures have rutting values higher than 20 mm; therefore, the analysis is focused on such structures, with the purpose of eliminating the uncertainty on structures being close to the limit. Such structures represent an I8% of the total, and they mainly show a thickness decrease of cement-treaded base layer. This group shows a clear trend to increase rutting, as long as the asphalt layer thickness decreases (Figure 3). The same trend is observed for IRI and bottom-up cracking. Figure 3 does not show a correlation of thickness variation on cement-treaded base layer compared to pavement damages. However, among failing structures having more than 20 cm rutting, the 78% shows a cement-treaded base layer lower than original design. In some cases failure takes place even in structures having a asphalt layer thickness slightly higher than the original design. Therefore, there is a considerable effect of this layer thickness reduction on the structure performance. 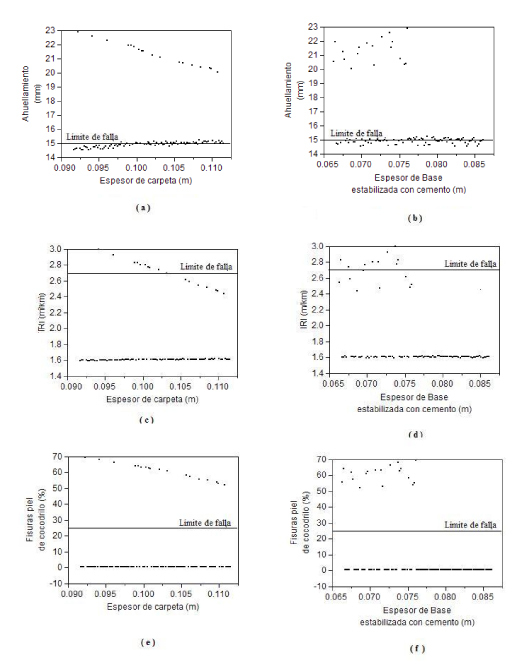 The results from this study show that asphalt layer thickness variations significantly affects the pavement performance, even when such variations are within the tolerances allowed by Colombian construction specifications. On the other hand, layer thickness variations on granular base and sub-base, within allowed limits, do not significantly affect the pavement performance. The analysis developed for Structure 1, concluded that the determining damage for an early failure on the pavement structure is rutting. It was determined that as long as the asphaltic layer thickness decreases, rutting increases; even when the asphalt layer thickness variations remain within allowed tolerances. Although IRI and bottom-up cracking parameters did not reach failure limit at all, such damages showed the same trend towards rutting. The analysis of this structure did not reveal a correlation between studied damages and the thicknesses variations on granular base and granular sub-base layers, within allowed tolerances. It was also concluded that among failing structures, there were granular base and granular sub-base layers with thicknesses higher than the original design. Consequently, there is a minor influence of granular layers thicknesses variations - within allowed tolerances - on the pavement performance. The analysis on Structure 2 confirms that thicknesses variations on granular base and sub-base layers, within allowed tolerances, have a minor influence on the pavement performance. For this structure failures took place due to rutting, IRI and bottom-up cracking. All such damages show a high correlation with asphalt layer thicknesses variations: as long as the asphalt layer thickness is decreased, damage is increased, even maintaining thickness variations within tolerances allowed by Colombian specifications. Although a direct correlation between the thickness variation of a cement-treaded base layer and the studied damages was not found, it was actually observed that among failing structures, the 78% had cement-treaded layer thicknesses lower than the original design; several of them failed even having asphalt layer thicknesses higher than the original design. Consequently, it was proven that the thickness variation of a cement-treaded base layer does affect the pavement performance, even within allowed tolerances. Although the results of this preliminary research justify the development of further studies at full scale (including several scenarios and local conditions, by considering the respective local calibration of MEPDG performance models), the results from the current research demonstrate it is advisable to eliminate tolerances, which allow asphalt layers and cement-treaded base layers of flexible pavements to be constructed using thicknesses lower than the ones specified in the original design.